Did you see Melinda's blog posting about her newest finished Halloweenies? She did an awesome job. 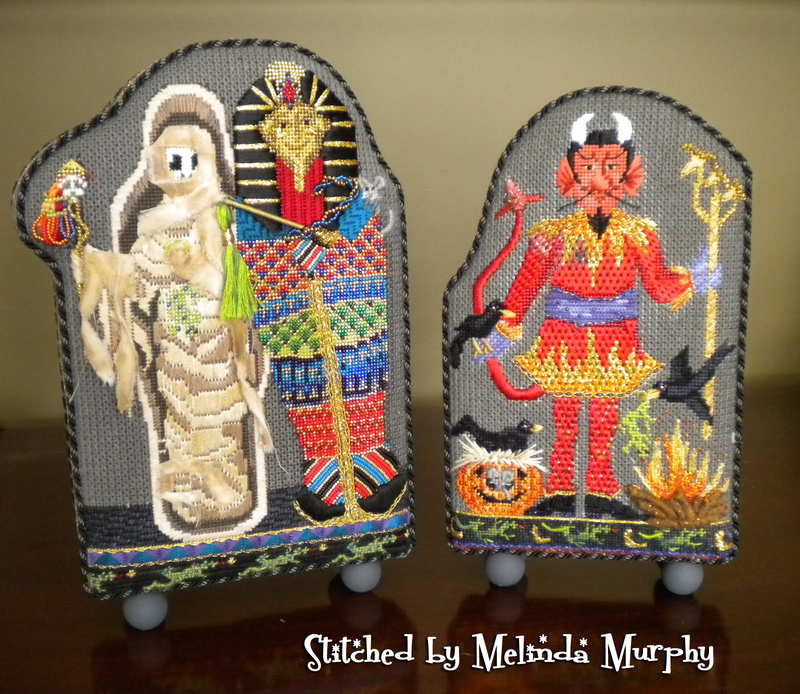 Melinda writes the Living the Good Life blog. 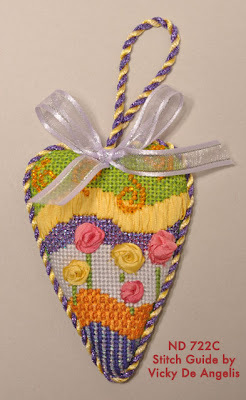 Here's the link to her latest entry, Familiar Faces. Wanted to share this photo of Leo. He is one of our new kittens; brother to Lana. Leo is our Photographer's Apprentice in Training. He's doing a good job, don't you think? Hope you are doing fine. 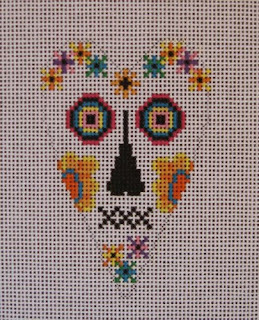 I've been busy stitching the newest (#10) Creepy Character from NeedleDeeva for its debut at Ruth Schmuff's shop, Bedecked & Beadazzled, during my trip to Baltimore for TNNA Fall Market. 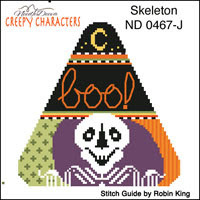 His name is The Skeleton (ND 0467-J) and will be available from Ruth. You can take the class in person as well as mail order; just contact them for information. 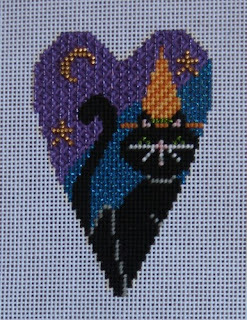 Speaking of classes... there are 11 seats remaining for my Fraidy Cat class on Friday, August 12, 2011. 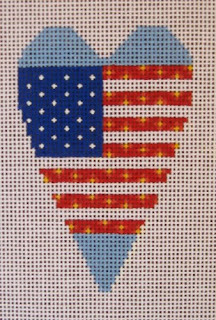 Any Shop Owners attending the Baltimore/TNNA Fall Market with 3 hours to spare, come join me from 2PM-5PM. 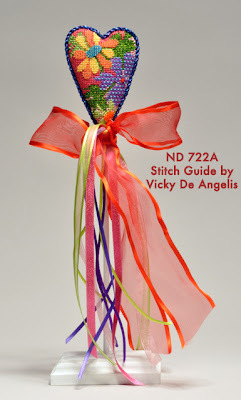 You get the canvas, stitch guide, threads and ME. I would love to see you. OK... now to our topic, Insomnia. Luckily I don't have it, although if I did, I would make use of my time and get more stitching done. LOL. 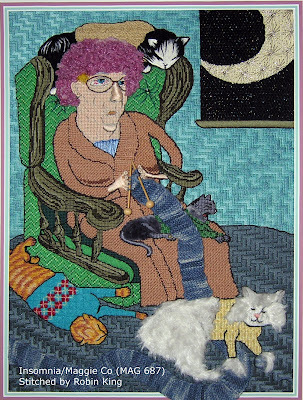 Here is a needlepoint titled, INSOMNIA, from artist Jeanju Clifton. I have a story about it (of course) so here goes. Several years ago, Pat (my guy), photographer/owner of Business Visuals, photographed the original artwork for artist, Jeanju Clifton. 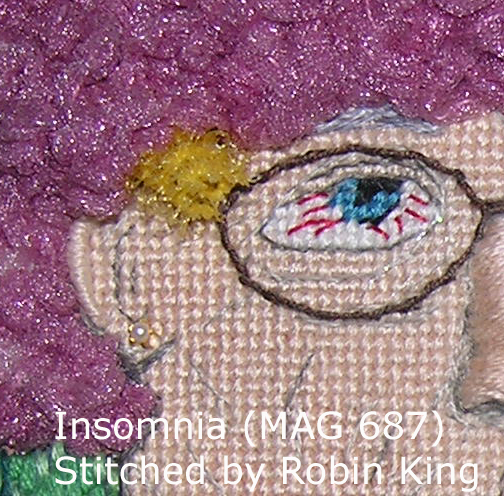 The name of the piece was "Insomnia." When I saw the art, I said to myself, "This would be the best piece for needlepoint." 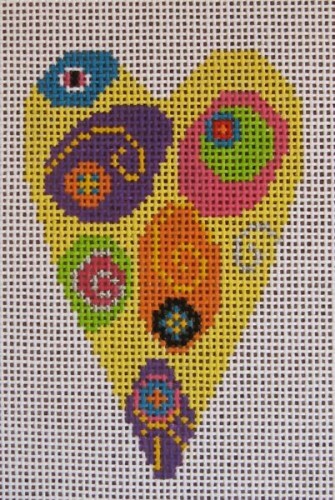 I asked Amy Bunger to create a Custom Stitch Guide for Insomnia (she did) and I stitched it. It is one of my cherished pieces because I brought it to needlepoint life. I even learned how to knit. I went to my local knit shop in Memphis called Yarniverse, and told them I had specific needs to learn how to knit. 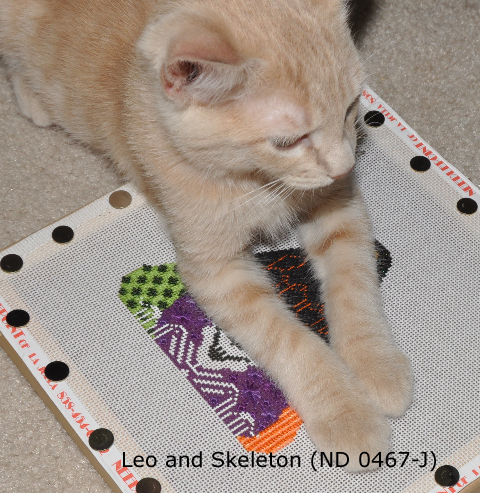 I brought in the Insomnia canvas and showed them where the knitting was going. I learned on "average" knitting needles with "no big deal" yarn. 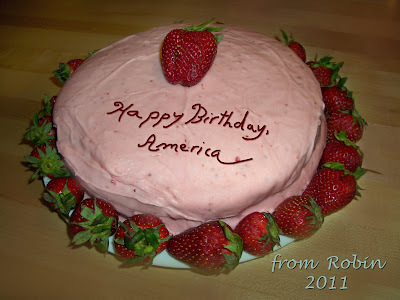 Then, I applied my new skills (LOL... 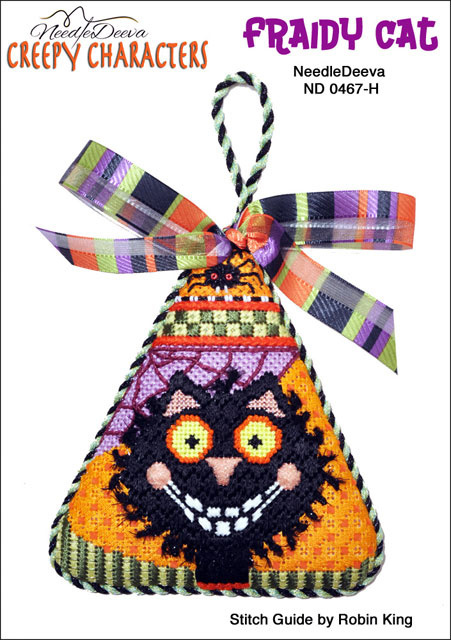 I can't talk and knit at the same time!) 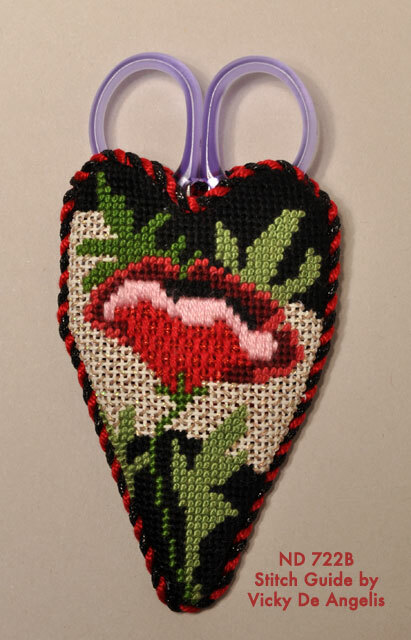 to the stitch guide suggested thread: Poppies by Gumnut Yarns. I used 0000 Bamboo Knitting Needles for the best size/proportion. (ooohwee... they were tiny!) Then, I cut the Bamboo Knitting Needles in half, glued a wooden bead, knitted half onto each stick, and placed them within her wire-wrapped hands so that Insomnia would be actually knitting the scarf. You know me... if you're gonna do it... do it right! 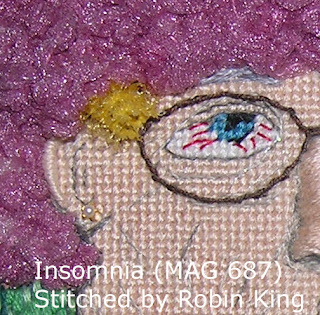 Insomnia is wearing a Chenille robe made of Colonial Knots. Her curler cap was Gathered Flair, and I even found a tiny curler to add for realism. Notice the Pearl Earring? Our lady is styling. And, ... each cat is wearing a knitted sweater. OMG. So funny. 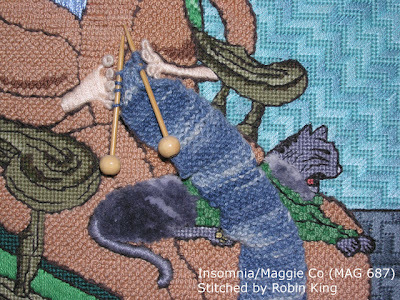 So, if you have insomnia, love cats, love to knit or just want to stitch some humor, check out INSOMNIA from Maggie Co (MAG 687) and the Amy Bunger Stitch Guide. It's tried and true. P.S. 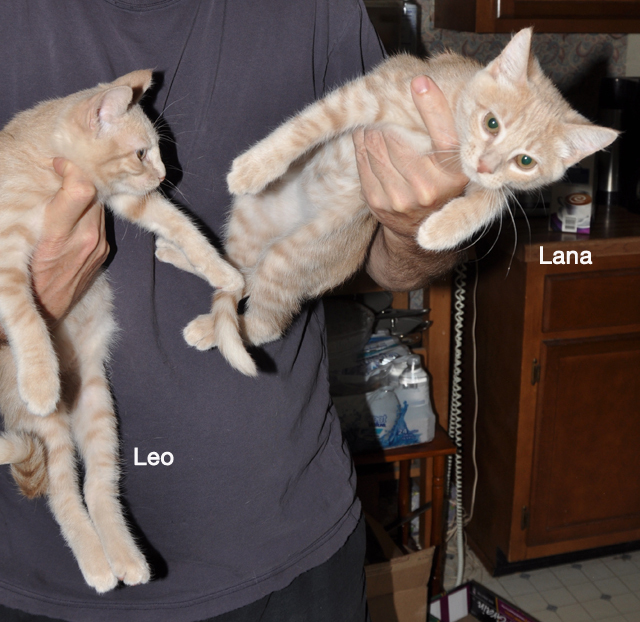 here's a quick photo of Leo and Lana, our new kittens. Sweet peas, indeed. Here is a snippet of yesterday's temperatures in Memphis, TN. Ooohh wee... it's HOT. Today is supposed to be the same. Yeow! If you've been following Vicky De Angelis' blog, Mostly Needlepoint, you saw a preview of the brand new... haven't been stitched yet... will be debuted in Baltimore at the TNNA Fall Market... NEW Hearts. Same size. So cute. They each will come with Vicky De Angelis stitch guides, too. P.S. Next blog, I will have some KITTEN news to share with you. Happy July 4th to all. 235 Candles is a lot to try to blow out. Today I am charting the stitches used in the Creepy Characters stitch guides. 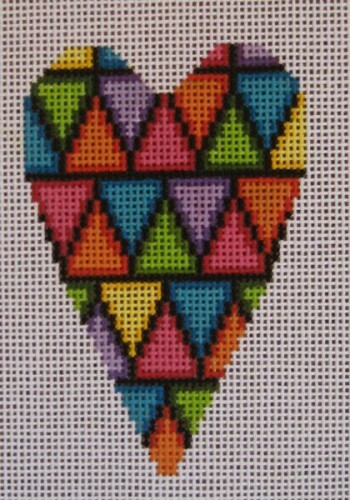 I have 3 guides done; only 6 more to go.